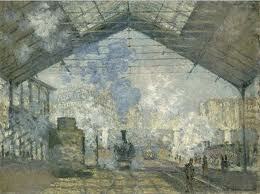 Monet produced more than one version of this famous painting of the steam belching out of locomotives sitting under a station canopy. Obviously, the era is many decades before that of my layout, but that atmosphere (literally) even I remember as a child growing up in the 50s and 60s. The era I'm desirous of creating is late 50s early 60s when steam still mixed with diesel and electric power in France. 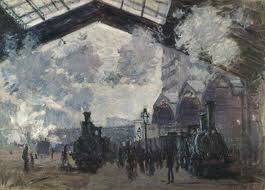 My station will have a pitched canopy a la Monet - could it also have that steam filled atmosphere? Well, apparently it could. 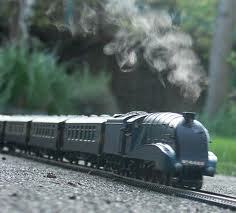 Hornby have produced a "live steam" model. And here is a video of a version by the Austrian maker, Roco. 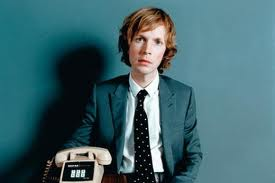 Whatever happened to that eccentric, Beck? I'm not familiar with more than just a few of his songs. But, those I really like. Rather, worryingly, after most games of squash I find myself whistling the tune to this song. Gare du Nord - draft 2.